Tilda Swinton and her daughter Honor Swinton-Byrne attended the photocall & premiere for their new film 'The Souvenir' today(February 12th) in Berlin, Germany. 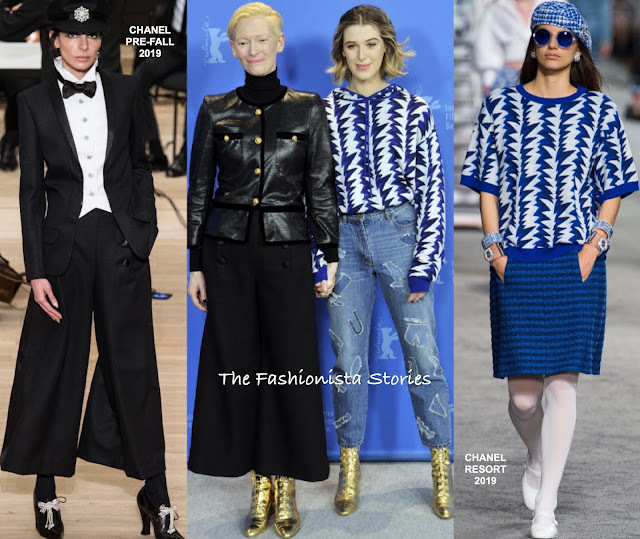 Tilda & Honor wore CHANEL for both appearances. Tilda Swinton looked great as always wearing a black turtleneck with an black velvet panel jacket over it and black wide-leg culottes. You may remember that Tilda wore these same Chanel culottes at the festival last year. However there is nothing wrong with repeating a look and those gold boots which are also Chanel are to die for. Honor Swinton-Byrne opted for a more casual look, which featured a RESORT 2019 hoodie and patchwork denim. Like mother, like daughter because Honor wore the same gold boots as Tilda. However it works more with Tilda's look. Tilda Swinton wore another all black look, this time from the SPRING 2019 COUTURE collection. Her dress which stopped just about her ankles, where teamed with black opera tights and black satin ankle boots. I am on the fence here, because of the shape. While this is not a bad look, she has definitely done better. Honor Swinton-Byrne followed her mother once again, opting for an all black look. She wore a black crop sweater and a SPRING 2019 black sequin midi skirt, which she styled with black cut-out heels. I wish she wore the runway's white button down shirt, because it's a better look.